From New Jersey to Nicaragua, your generosity and activism continue to build community and extend support to those who need it most. Take a look! Our community continues to grow! About 75 people came out to our 24th Annual Solidarity Roast and between donations and ticket sales, we raised about $4000 for our Nica partners. Our topic for the September 12th Dinner Forum will be “The Fight for $15.” Meet organizers from The Fight for $15 and low wage workers from the fast food, airport and security industries who are uniting in their struggle against poverty and inequality. In just the past six weeks nearly 100 people have liked us on Facebook. 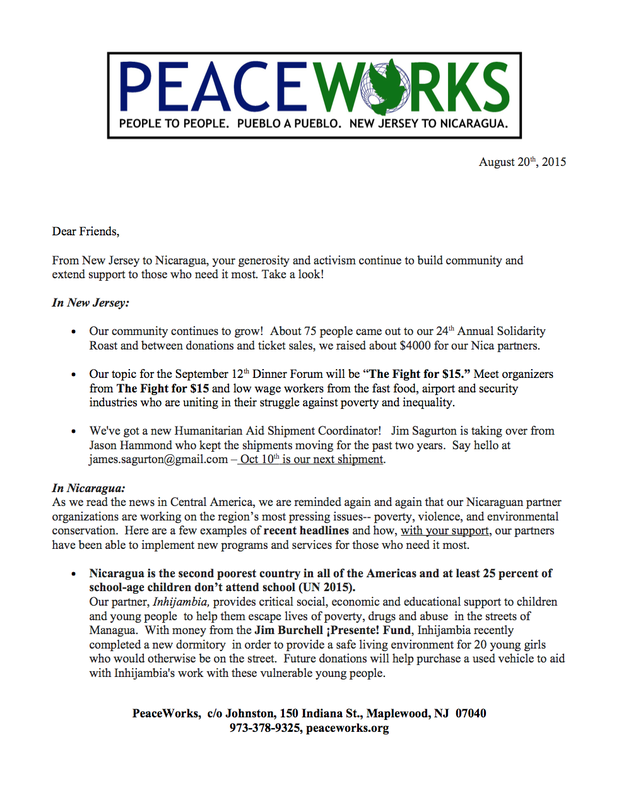 Just search for PeaceWorks NJ on Facebook…and while on the web, check out the new peaceworks.org! We’ve got a new Humanitarian Aid Shipment Coordinator! Jim Sagurton is taking over from Jason Hammond who kept the shipments moving for the past two years. Say hello at james.sagurton@gmail.com – Oct 10th is our next shipment. As we read the news in Central America, we are reminded again and again that our Nicaraguan partner organizations are working on the region’s most pressing issues– poverty, violence, and environmental conservation. Here are a few examples of recent headlines and how, with your support, our partners have been able to implement new programs and services for those who need it most. Nicaragua is the second poorest country in all of the Americas and at least 25 percent of school-age children don’t attend school (UN 2015). Our partner, Inhijambia, provides critical social, economic and educational support to children and young people to help them escape lives of poverty, drugs and abuse in the streets of Managua. With money from the Jim Burchell ¡Presente! Fund, Inhijambia recently completed a new dormitory in order to provide a safe living environment for 20 young girls who would otherwise be on the street. Future donations will help purchase a used vehicle to aid with Inhijambia’s work with these vulnerable young people. Nicaragua has the second highest incidence of domestic violence in the region. One third to one half of Nicaraguan women have experienced violence by men (UN 2015). Our partner, the Axayacatl Masaya Women’s Collective, supports survivors of domestic violence through counseling and economic empowerment programs, as well as local advocacy. With money from the Jim Burchell ¡Presente! Fund, Axayacatl will build a new office for their programs. Future donations will help expand services for these women and families who often have nowhere else to turn. Sea turtles continue to be endangered in Nicaragua and worldwide, but thanks to local conservation efforts, numbers are slowly increasing on Nicaragua’s shores (WWF 2015). Our partner, the Palo de Oro ecotourism project and sea turtle hatchery, provides employment for local families, while protecting endangered sea turtles and their offspring. With the help of donations and volunteers, these efforts are beginning to pay off as more turtles and their eggs are protected from poachers. Chemicals used in conventional coffee farming are the cause of growing health problems among workers and water pollution throughout Latin America (UNEP 2015). Our partner, the El Porvenir Cooperative, grows and sells organic coffee, providing a livelihood for 43 families in a mountaintop community. This month, the cooperative will be able to purchase a much needed vehicle with PeaceWorks donations. You also can support El Porvenir by purchasing their coffee at PeaceWorks events. 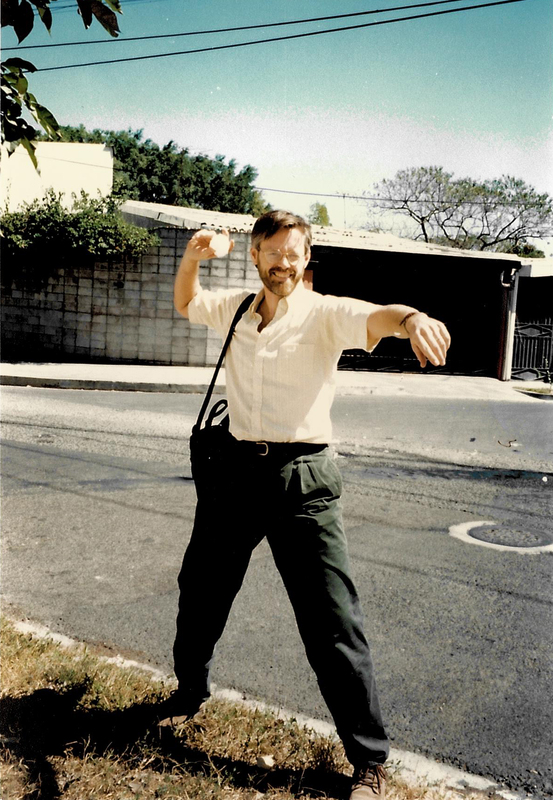 Donate to the Jim Burchell ¡Presente! Fund to continue supporting these and other projects. For more information and for updates on all of our partners, visit our new website at www.peaceworks.org. None of this work would be possible without your steadfast support.